London is more than just a city: it’s a global centre for business and culture, and a multicultural giant that offers you an unforgettable life experience. With just shy of 11 million inhabitants speaking more than 300 languages, it’s impossible to spend time there without expanding your personal horizons and professional network. Whether you’re heading for a career in the Finance sector or dreaming of working for a leading Luxury brand or Tech company, London has it all waiting for you. There are job opportunities at the biggest brands in the world, as well as an incredible number of innovative start-ups. From internships to graduate schemes and beyond, London is your launch pad! In 2018 London was crowned the most popular city in the world for students. It’s also been named the best in which to work – and the most loved tourist destination. This city really has something for everyone, and the polls prove it. 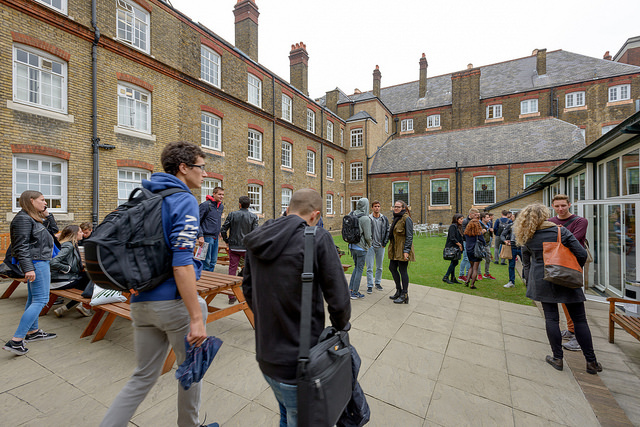 ESCP Europe is a unique school that attracts students and academics representing more than 100 nationalities to our London campus. Located in West Hampstead in north west London, ESCP Europe’s UK campus offers students state-of-the-art facilities in a traditional Victorian building. The bright city lights and the business community are only a tube ride away, while the fashionable area of West Hampstead offers a broad cultural experience away from the hustle and bustle of inner-city life. Students benefit from our strong connections in major industries, and we play an essential role in our students’ lives by expanding and nurturing the skills vital for their future careers. The first Digital Transformation and Innovation Forum of 2019! The London Campus welcomed 205 attendees from 23 universities for the international competition. Prof. Simon Mercado is joined by Lord David Gold and Tony Matharu to analyse the status of Brext. Interested in a career in the Energy sector? Join this free event! Interested in a career in Marketing? Join this free event! Join us to discover our three-campus, three-year Undergraduate programme! Interested in a Digital Transformation masters? Join our free online event on 1st May! Get to know another amazing Student Society at ESCP Europe! The event takes place on 16th and 17th February in Sheffield. A forward-thinking event by our Young Leadership Forum student society. Prof. Simon Mercado shares his thoughts on the inescapable questions around Brexit. Each November, ESCP Europe celebrates its yearly Jean-Baptiste Say Entrepreneurship Festival. 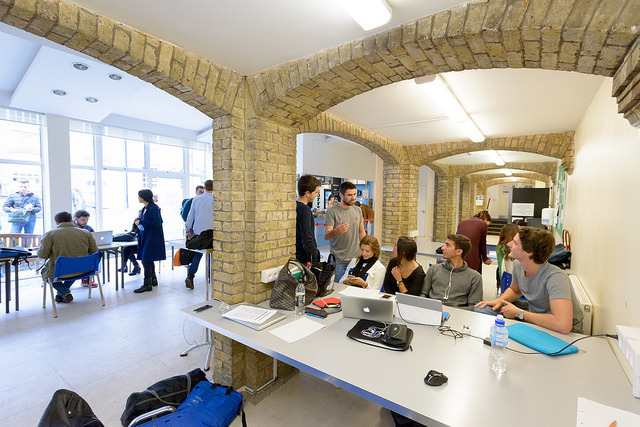 The London campus offers a family atmosphere in a beautiful and historic Victorian building. Study and teaching spaces sit alongside a private garden and student lounge - everything you need for an enriching time on campus! There are 15 lecture rooms with seating capacities ranging from 20-150 people. Computers are available for student use in the library, study room F10, the Trading Room and computer room, with a total of 83 computers and 4 printers. Wi-fi is also available throughout the building. Amenities include a student lounge and recreation room, the simulation Trading Room, language lab, campus cafe and a function space, the latter of which features a magnificent fireplace and stained glass window. Experience first-hand the dynamics of financial markets. Trading Room workshops are an integral part of all programmes hosted at the School, from our Master and Bachelor degrees, right through to our European Executive MBA. In addition to this, we host regular extra-curricular sessions with external partners and offer use of the facilities to visiting study groups. All of these activities combined allow more than 2,000 students each year the opportunity to experience first-hand the dynamics of the financial market. Scheduled for an early lecture? Pick up a tasty wake-up call with a cup of tea or an organic, fairtrade coffee, then pair it with a fruit salad, granola pot, muffin, buttered toast or croissant. Andras is also offering delicious smoothies, also made in-house. When lunch rolls around, you can grab a salad box. Each day will offer both vegetarian and meat options - again, all made right here on the premises. Also on offer: hot and hearty soups, fresh paninis and a range of sandwiches. Alongside the classic combinations will be daily specials. Andras is known for his delicious cakes, too - he'll be selling a too-die-for selection of homemade baked goods every day. Dietary Restrictions: If you have any allergies or special requests, please do not hesitate to ask the cafe team for advice or adjusted dishes. We have a huge range of active Clubs and Societies for students to join! Whether you've been doing it for years or feel like trying something new, there are an enormous variety of opportunities via student societies at the London campus! Get involved, make new friends, have fun, and be part of the student community! * From here, you can take bus 13 or 113, alighting at Lyncroft Gardens, or walk up Finchley Road for approximatively 20 minutes. * From here, you can take the Underground. Get a Metropolitan line train, alighting at Finchley Road station. From here, you can take bus 13 or 113, alighting at Lyncroft Gardens, or walk up Finchley Road for approximatively 20 minutes. You can choose from six major airports to fly into London: Heathrow, Gatwick, City, Stansted, Luton or Southend. Each has bus and/or rail links into the city centre. Click here for airport-city transfer advice.